The region of Kyustendil has fertile valleys and canyons, punctuated by hillocks and mountains. The region has a mild climate. Its claim to fame is the presence of numerous mineral springs that have been lauded for their curative properties since antiquity. Among the most famous are those in Kyustendil, Sapareva Banya (known as the warmest in Europe), and in the villages of Nevestino and Chetirsti. The region is dedicated to promoting health, and many Bulgarians and foreigners come to Kyustendil to visit the springs and karst waters, and the curative peat from Baikal. Other natural attractions are the Stobski Piramidi, jagged rock formations along the cliffs of the town of Stob, the graceful 70-metre high Skakavitza Waterfall, and Rila National Park, in which can be found Bulgaria’s largest and most beautiful monastery, the Rila Monastery. There are also a number of medieval churches and remains of ancient Thracian settlements. Kyustendil is a natural site for alpine tourism, with cabins and clearly marked skiing and hiking trails down the slopes of the nearby mountains. Its abundant and largely untouched coniferous forests help Kyustendil maintain its record for being a clean and ecologically sound area. 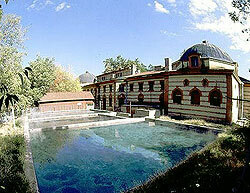 Its many hot mineral springs also makes Kyustendil a magnet for those who want to take the cure. Thanks to its forgiving climate and fertile soil, Kyustendil has long been a fruit-growing area. Apples, cherries, plums, pears and other produce have been grown here for centuries. Situated at the foot of the Balkans’ highest mountain and surrounded by verdant forests, the town of Dupnitsa is one of the region’s fast-growing commercial and business centres. Dupnitsa also benefits from the attractions of its neighbours. Many people come to the nearby town of Sapareva Banya for its mineral springs and clear mountain water, and the geyser that spouts in the middle of town. Others go to the big ski resorts that are also close by. And many make pilgrimages to the Rila Monastery. The monastery, the largest in Bulgaria, is a complex of towers, chapels, a church and dormitories (where visitors can stay for the night) around a courtyard. It has been damaged, razed and rebuilt over the centuries, until the 700-year-old defence tower is the only one of the original structures left standing, but the monastery is a monument of architectural and historical importance. Dupnitsa has a hopping night life, with lots of clubs, pubs and hotels. Daytime activities are Many festivals are also held in the town during the spring and summer.